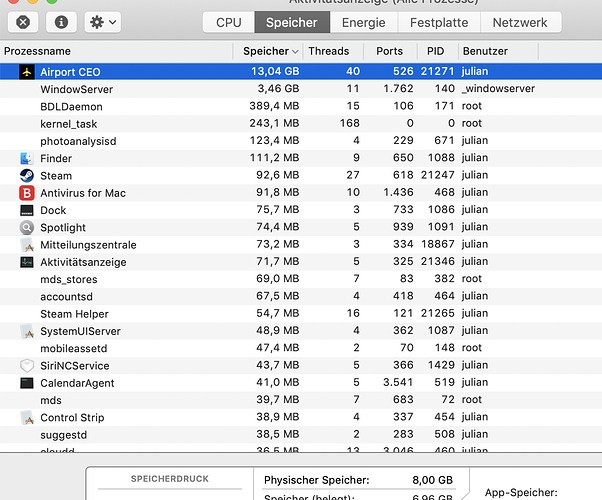 how can Airport CEO even use 13 GB of RAM when I only got 8 GB installed? Can someone explain? I have quit a big airport under construction at the moment, and only have around 10 - 15 fps. Wow, that does seem high. OS X will use VM if it runs out of real memory which will slow things down considerably. When it comes to RAM, i can test savefiles untill 64GB of RAM usage. Your WindowServer also seems a little high TBH as well. I’d suggest at this point the EXP branch is stable enough and would give that a try. I’m looking at around 6.8GB of RAM used. Your game is taking more than my currently running PS as well and I’ve some heavy documents open with that as well. Have you done a safe mode boot lately? That might help as well. I’m at 24GB so do quite well too. You can get the EXP branch by right clicking on AiportCEO in Steam and then click the properties and Beta tab. You can get it from there. To do a safe mode boot, hold the shift key down as you start the Machine, speaking of which what model do you have? Once safe mode has started just log in and then do a reboot. FYI a Mac user also. I have a MacBook Pro 13"! Steam wants a beta-key, what is that? What year and you should just be able to select it from the drop down menu. Key is for other things. Your weakest part will be the integrated GPU. Sweet machine though. Ah now I get it, it’s already downloading the EXP branch. I will give it a try! No worries and do a safe boot too before testing. That’s does all sorts of wonderful things. Nothing changed on the RAM usage. Maybe this a good argument to spend money on a new PC lol. Hmmm, that still does not seem quite right to me. @Puma how much does it take on your MBP? This is very strange… is it the same regardless of what save you’re on? What is the usage on the main menu? Checked a fairly large world on my mac, I get around 2 GB in the main menu and around 3 in-game. So no idea how it can consume 13 GB, how large is the world? RAM usage will significantly drop with the multiple floors update. We have a new grid system in place which will drastically affect that. Hi Olof, thanks for you reply. 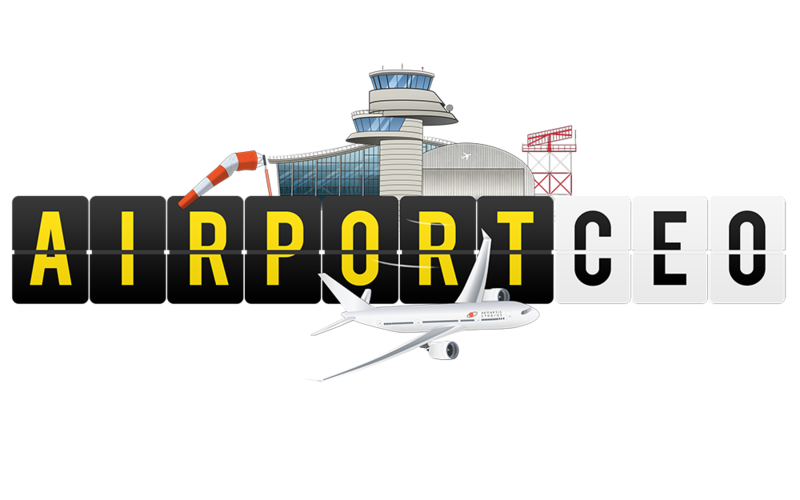 I just tested what happens when I start with a new airport. In the main menu I also have around 2 GB but as soon as it starts to load the world it goes up to 10 GB. How large exactly is this airport? Have you edited the map size? No, just unlocked the other three “areas”. 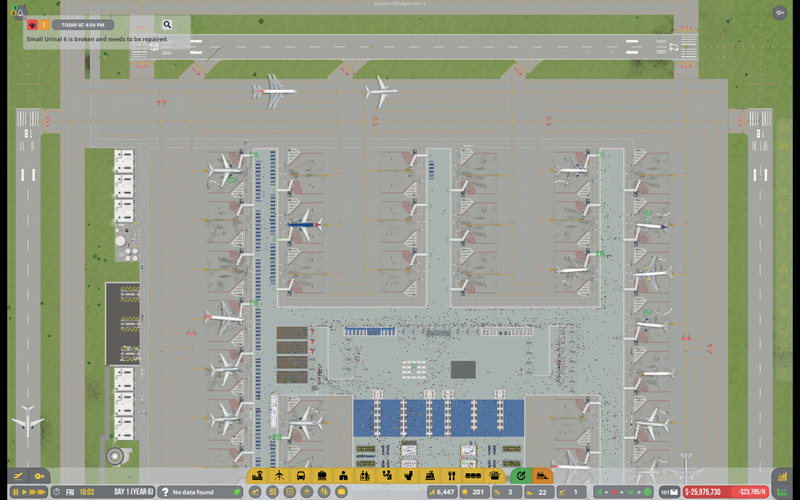 I have 4 runways and an extremely large terminal. When loading this airport I have a usage of 12,40 GB. When I starte a whole new airport, I have a usage of 10 GB. That’s a little larger than I’d imagined That might not be out of the ordinary then. Cool build too. New airport still sounds large.